The colliery worked the 2, 3, 5 & 6 foot coal seams. With the dangerous work and after a number of deaths, there was felt a need for prayer meetings before work. in the 5 ft. seam at 348 feet and 6 ft. seam at 774 feet below the surface. Showing part of the Mineral Railway crossing Heol Gwyrosydd, Penlan. A great deal of Swansea Council housing was being built at the end of the 1945 war onwards. The recenlty built Tudno Place off Heol Gwyrosydd can be seen, with what would have been the old railway crossing in the upper right-hand corner of the development. 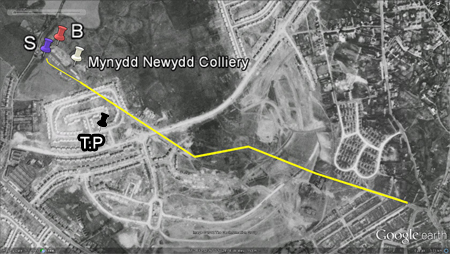 Mynydd Newydd Colliery 1945 Google Earth. In The Chapel Down, Mynydd Newydd Pit. (This was in the 5 foot seam). The miners in the photo took part in a *BBC religious broadcast. Broughton Avenue & Heol Pen-Tir Garw, Mynydd Newydd Road. The image shows the east end joining Penfilia Road, Brynhyfryd. 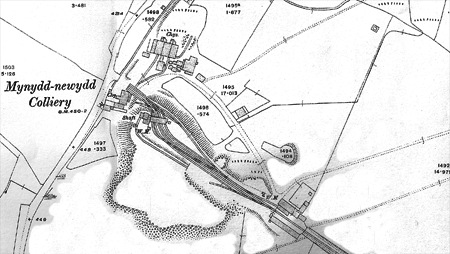 The railway actually carried on down to the Swansea canal at Landore a total distance 1 1/2 miles. "Mynydd Newydd" meaning "New Mountain" source Google Translate. of the distance to the pit." The Mine was sunk by Vivian & Company down to the five foot seam at a depth of 130 yards. (C) F56 DISASTERS AND ACCIDENTS, etc. 1844 Dec.28 Inquest on James Thomas,36, killed at Swansea Coal Co's Mynydd Newydd Colliery. John Jenkins gives evidence. (C) H34 BUILDINGS, COMMERCIAL , etc. 1844 Dec.28 Inquest at the Plough and Harrow, Pentre, near Swansea, on man killed at Mynydd Newydd Colliery. 1st Bible purchased from Evan Griffiths' shop for the underground chapel. (C) F56 DISASTERS AND ACCIDENTS, etc. 1846 May22 Mynydd Newydd explosion: David Jones,14, David Jones,12, William Lodwick,12 & John David,17, killed. Report of inquest. (C) J21 MINING AND INDUSTRY, etc. 1846 Aug.21 Swansea Coal Company - Mynydd Newydd Colliery, prayers held. (C) N00 RELIGION 1846 Aug.21 Mynydd Newydd Colliery prayers: E.G.Williams,of Sketty. T.Davies, of Caersalem; E.Jacobs and D.Howell, both of Swansea. (C) F54 DISASTERS AND ACCIDENTS, etc. 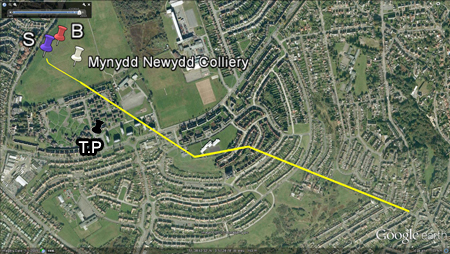 1847 Jan.01 Accident on the tramroad from Mynydd Newydd Colliery to the canal near Landore. (C) F54 DISASTERS AND ACCIDENTS, etc. 1847 Feb.05 Letter re danger of accidents on the railway at Landore from Mynydd Newydd Colliery. (C) F56 DISASTERS AND ACCIDENTS, etc. 1849 Nov.16 William Jones, aged 15, son Thomas Jones, Caebricks, killed at Mynydd Newydd Colliery. (C) F56 DISASTERS AND ACCIDENTS, etc. 1851 Dec.12 John Phillips, aged 20,killed at Mynydd Newydd Colliery near Swansea. (C) J21 MINING AND INDUSTRY, etc. 1860 Mar.02 Short report on Mynydd Newydd Colliery which had a fire in June 1859 (Capt. Lowery). P3. (C) D42 TRANSPORT, ROAD etc. 1867 Nov.01 Swansea police: Vivian & Sons -V- E.Brennan & C.Sheen - theft from Mynydd Newydd tramroad. P6. (C) F52 DISASTERS AND ACCIDENTS, etc 1869 Apr.02 Explosion at Mynydd Newydd Colliery. John Lewis, Fireman, identifies body of his son Enoch, aged 16. (C) J21 MINING AND INDUSTRY, etc. 1869 Apr.02 Explosion at Mynydd Newydd Colliery. W.M.Palmer of Weig, witness. 17 yr. old son John, mentioned. (C) J21 MINING AND INDUSTRY, etc. 1899 Mar.31 "The Coal Miners' Prayer", sent by Elizabeth Seaton, of Kent, re the underground chapel at Mynydd Newydd Colliery, Swansea. (WM) K22 SOCIAL, EMPLOYMENT, etc. 1902 Sep.04 Conflict between police & strikers at Mynydd Newydd Pentre collieries, Fforestfach. Attacks on non-unionists. (WM) K22 SOCIAL, EMPLOYMENT, etc 1902 Sep.05 Strike at Mynydd Newydd Colliery Fforestfach: Men set out their demands to Mr. Naysmith, manager. Assault on non-unionist. (WM) K22 SOCIAL, EMPLOYMENT,, etc 1902 Sep.06 Strikers from Mynydd Newydd Colliery attack police (under Sgt Hopkins) escorting workers home at Brynhyfryd and Landore. (C) J21 MINING AND INDUSTRY, etc 1902 Sep.12 Mynydd Newydd Colliery: strike: Margaret Watts, Llangafelach, alleged to have assaulted David James, Colliery watchman. (C) J21 MINING AND INDUSTRY, etc 1902 Sep.12 Mynydd Newydd Colliery: striking miners try to influence non-striking miners at P.Richards' Weig Fawr Colliery, Cockett. (C) J21 MINING AND INDUSTRY, etc 1902 Sep.12 Mynydd Newydd Colliery strike: Demonstration by striking miners held at Cockett - Fforestfach fife & drum band attend. (C) J21 MINING AND INDUSTRY, etc 1902 Sep.12 Mynydd Newydd Colliery strike: John Hughes, underground overman, gives evidence against Thomas Davies & David John Davies. (C) J21 MINING AND INDUSTRY, etc 1902 Sep.12 Mynydd Newydd Colliery strike: Thomas Roberts, colliery watchman claims to have been struck by a thrown clod. (C) J21 MINING AND INDUSTRY, etc 1902 Sep.12 Mynydd Newydd Colliery strike:To prevent intimidation Messrs Vivian & Sons give non-union men food & beds at colliery. (C) K22 SOCIAL, EMPLOYMENT, etc. 1902 Sep.12 Fforestfach fife & drum band attend Mynydd Newydd Colliery strike: Demonstration by striking miners held at Cockett. (C) K22 SOCIAL, EMPLOYMENT, etc. 1902 Sep.12 Mynydd Newydd Colliery: stike: Margaret Watts, Llangafelach, alleged to have assaulated David James, colliery watchman. (C) K22 SOCIAL, EMPLOYMENT, etc. 1902 Sep.12 Mynydd Newydd Colliery: striking miners try to influence non-striking miners at P.Richards' Weig Fawr Colliery, Cockett. (C) K22 SOCIAL, EMPLOYMENT, etc. 1902 Sep.12 Mynydd Newydd colliery strike: Demonstratin by striking miners held at Cockett - Fforestfach fife & drum band attend. (C) K22 SOCIAL, EMPLOYMENT, etc. 1902 Sep.12 Mynydd Newydd Colliery strike: Thomas Roberts, colliery watchman claims to have been struck by a thrown clod. (C) Q18 CRIME AND PUNISHMENT etc. 1902 Sep.12 Mynydd Newydd Colliery: Strike: Margaret Watts, Llangafelach, alleged to have assaulted David James, colliery watchman. (C) R33 CULTURE AND THE ARTS, etc. 1902 Sep.12 Fforestfach fife & drum band attend Mynydd Newydd Colliery strike: Demonstration by striking miners held at Cockett. (WM) K22 SOCIAL, EMPLOYMENT, etc. 1902 Sep.16 No sign of settlement in Mond Nickell Works dispute or at Mynydd Newydd. (WM) K22 SOCIAL, EMPLOYMENT, etc. 1902 Sep.17 T Hopkins presided at meeting in support of striking miners at Mynydd Newydd & Pentre pit. Ben Tillett condemns Dr. Mond. (WM) K22 SOCIAL, EMPLOYMENT, etc. 1902 Oct.17 John Williams, miners agent, & C.Eden try to bring 2 month strike at Mynydd Newydd & Pentre collieries to an end. (WM) J21 MINING AND INDUSTRY, etc 1903 Apr.30 Mr Deakin, Parkend & Ben Davies, Miners, Miners' agent, Pentre, investigate dispute at Mynydd Newydd Colliery with Messrs Vivian. (WM) J20 MINING AND INDUSTRY, etc 1924 Jul.12 Funeral of Major Thomas Gray, M.E, J.P., Underhill, Port Talbot - Thomas Mort (representing Mynydd Newydd Colliery, Swansea). The colliery was finally abandoned due to flooding. See Later, Mynydd Newydd Drift. N/A Drawing: Pit Head Showing The Original Cornish Beam Winding Engine, also mentioned the new horizontal steam engine and engine room. *BBC religious broadcast - I have contacted them to find if there is a recording of the event. www.screenandsound.llgc.org.uk - Recording details below. Hanes darllediad gan y BBC yn 1929 o oedfa grefyddol mewn capel dan ddaear ym mhwll glo Mynydd Newydd. 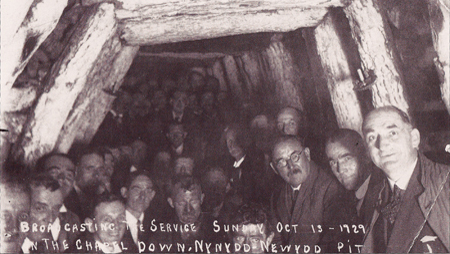 A 1929 service from an underground chapel located in a coal mine near Swansea. 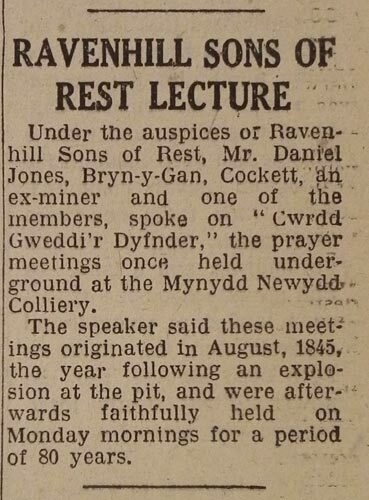 On Monday morning the 18th August, in the Mynydd Newydd Colliery, near Swansea, a Prayer Meeting was held underground. About 100 people were present. Their'agent, Mr. Daniel, was favourably inclined to the the event and promised them every support. They intend to hold the meeting every Monday morning at 6 o'clock. What could they do better? How fine to think of so many men starting the week's work with prayer to God without whose knowledge nothing can go on. It is said that not a swear-word was heard throughout the day. What a great reform !" Llyfryddiaeth Ieuan Ebblig : a checklist of the publications of Evan Griffiths, Swansea, between 1830 and 1867, page 65. "Mynydd Newydd "was used to filter the Cambrian index as best as possible with the information available, 28.05.2012.